Suspiros are traditionally made with vanilla but other flavorings like peppermint can be used, as well as combining nuts or chocolate chips. These cookies store well in an airtight container, but they will quickly become chewy and lose their crispness in a humid environment. 1) Place the egg whites and the cream of tartar in the bowl of a standing mixer. 2) Beat the egg whites on medium speed until the egg whites form soft peaks. 3) Gradually add the granulated sugar, while still beating the egg whites. Continue to beat the egg whites until they have increased in volume and are forming stiff peaks. Sift the powdered sugar together with the salt, then add gradually to the egg whites, continuing to beat, until well mixed. 4) Gently drip the vanilla extract into the meringue. 5) Preheat the oven to 200 degrees Fahrenheit. 6) Line two cookie sheets with parchment paper. Fit a piping bag with a large star tip, and fill the bag with the meringue. 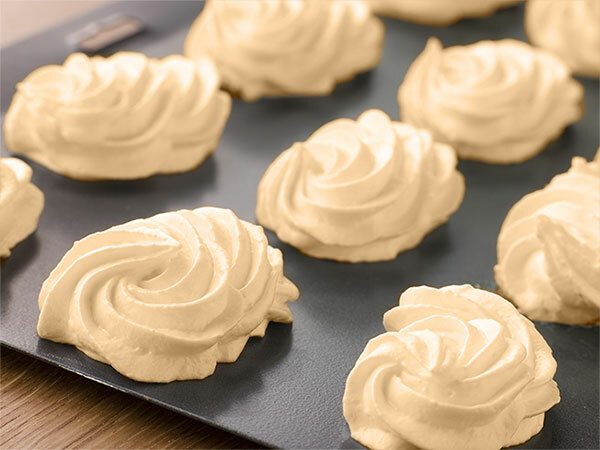 7) Pipe the meringue into small swirls onto the parchment-lined cookie sheets, spacing them about 1/2 inch apart. 8) Place the cookies in the oven and bake for about 1 hour, checking them every 15 minutes. Once they look crisp and well formed, turn off the heat and let them cool off in the oven for about 2 hours. 9) Serve the suspiros immediately or store them in an airtight container to ensure freshness.